Psoriasis isn’t really a skin condition—it’s a manifestation of an auto-immune condition. And a painful and unsightly one at that. T-cells are a type of white blood cell that is responsible for fighting off foreign substances (bacteria and viruses) and killing abnormal cells. If the immune system isn’t working properly, however, sometimes the T-cells go a little crazy and begin to attack healthy cells, too (1). The T-cells identify healthy skin cells as intruders and multiply to meet the threat. Blood vessels near the skin enlarge and white blood cells move in. More T-cells attacking means healthy cells have to reproduce at a faster pace , which generates more T and other white blood cells, and the cycle of psoriasis is set in motion. The new skin cells accumulate and move toward the outermost layer of skin much faster than normal. Your top layer of dead skin thickens, causing itching, burning, and cracked skin (2). No one is entirely sure why this happens. Certain medications: lithium, which is prescribed for bipolar disorder; high blood pressure medications such as beta-blockers; antimalarial drugs; and iodides. Because it isn’t really a skin condition but rather an immune disorder, psoriasis tends to erupt and subside. There exist several forms of psoriasis and its incidence depends on the individual’s genetic make-up and personal triggers. There are many natural remedies for psoriasis, however, if you are taking any kind of medication, check with your healthcare provider before self-medicating to avoid drug interaction. Just like medication doesn’t always work for everyone, certain plants may not quite meet your needs. It may take a while to find your perfect natural cure, but don’t give up: there is always a plant-based solution. Aloe vera – an exceptionally medicinal succulent plant, aloe can be applied topically to reduce inflammation, soothe sore skin, and heals psoriasis patches without steroids. Taken internally, aloe vera juice provides a whole-body anti-inflammatory cleanse. Oregon grape – this is a potent antimicrobial herb that boosts the immune system. Oregon grape tea can be taken internally as a tincture of applied topically a slave and has been shown to be effective in treating mild to moderate psoriasis outbreaks, providing relief. Berberine is an antimicrobial, antiviral, fungicidal, and antioxidant phytochemical present in Oregon grape. Ingestion of Oregon grape root cleanses the liver and regulates abnormal skin cell function (1). “Oregon grape root extract has a history in America of being an effective internal treatment of psoriasis for more than a century. A recent clinical trial assessing only its topical application confirms its modern usefulness in this form. Aside from berberine, pharmacological studies describe mechanisms for several of its other alkaloids that appear to be primarily responsible for its beneficial influence in this condition. As with all therapeutic agents for psoriasis, Oregon grape root extract lacks universal efficacy, but for select patients it provides a reasonable alternative.”(2). Tea tree oil – used for many skin conditions, melaleuca is a natural antiseptic that helps to remove dead skin, thereby reducing inflammation and itch. Mixed with water and applied to the affected area overnight on a regular basis can provide relief (3). Turmeric – a super spice, this bright yellow-orange rhizome is an efficacious anti-inflammatory spice comparable to steroids. Its key component is curcumin—a curcumin cream mixed with eucalyptus has been found to absorb readily into the skin—delivering its impact without the dilution of travelling through the digestive system (4). 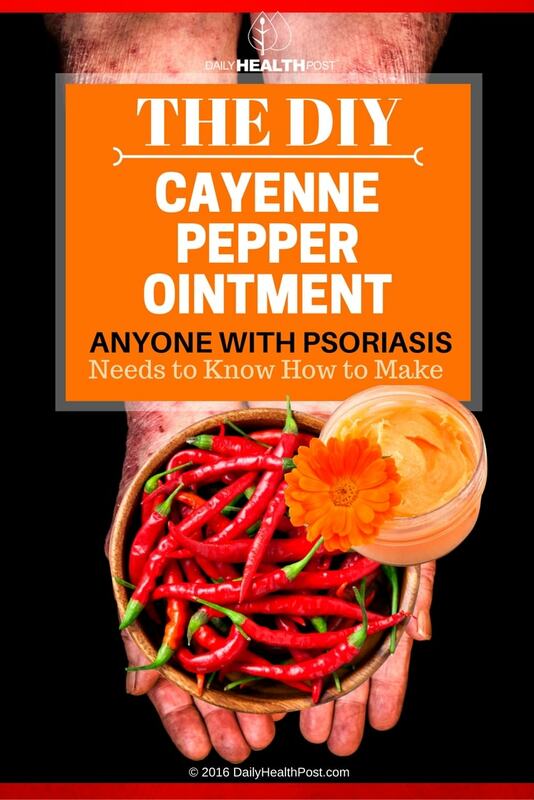 Capsaicin – responsible for the pigment and heat of cayenne peppers, this antibacterial, analgesic and anti-inflammatory coagulant compound can reduce pain and swelling of both the skin and joints caused by psoriasis. Initial application may sting but it will be followed by relief of pain and itching. It’s best to wear gloves when handling cayenne to avoid irritation of your skin and mucous membranes. If it does get on your skin, you can wash it off with olive or coconut oil and wipe with a clean dry cloth. Apply liquid dish soap to the washed area to remove oil residue on the skin and rinse. Mix together cayenne with oil and heat in a double boiler for 5-10 minutes over medium heat. Stir in beeswax and continue to stir until it has melted completely and all ingredients are well blended. Chill the mixture in the refrigerator for 10 minutes, then whisk until smooth and uniform. Chill for another 10-15 minutes and whisk again before putting it in a glass jar. Apply daily as needed for pain. Store in the refrigerator for up to 10 days.